The Right to Build Expos are a series of regionally focused events running throughout the UK until 2019. 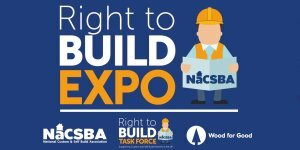 Run in partnership with NaCSBA (the National Custom and Self Build Association), the Right to Build Taskforce and Wood for Good, the events aim to provide information on how to make the most of the new Right to Build legislation. This places a duty on all local authorities in England to keep a Register of individuals and community groups who have expressed an interest in acquiring land to bring forward self-build and custom-build projects and to consider this when making planning decisions. Each event brings together a range of experts to help people kick-start their own custom and self build project. We’re sponsoring the Right to Build Expos in Fareham on 6 September and in Leeds on 29 November. To book your place at the Fareham event click here. The Leeds event will be available to book in the early autumn.